Observation - Green Bug - UK and Ireland. Description: Green bug with red and blue spots. If anyone can tell me what this is that would be great its been driving me mad for months! 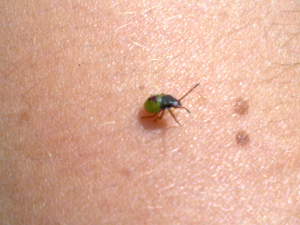 Green bug with red and blue spots. If anyone can tell me what this is that would be great its been driving me mad for months!